For a climate adaptation project in Ringkøbing-Skjern, a nature area with a lake, insectarium and sea of flowers are all developed before the housing. By Ringkøbing Fjord, Naturbydelen, the nature district of Ringkøbing, is being established on an 84 hectare site. The site has been used for agriculture over the past century, but will eventually contain 1,000 new houses. Unlike other new construction projects where homes and streets are established first, here grass is sown and trees planted prior to housing construction. 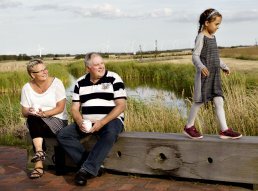 The area is a diverse natural area, containing an insectarium, fruit plantations, nature playgrounds, meadows, a creek, a lake (with a rope ferry) and a new forest with trails providing access to shopping, schools and more in Ringkøbing city. The first homes will be ready for occupation by summer 2018, where residents will be able to open their back door directly into wild nature. Naturbydelen has been created in cooperation between the municipality, local partners and the philanthropic association, Realdania. From the outset, local rainwater drainage has been integral to nature development in the area: watercourses and lakes have been created, which both enhance the nature experience for humans and improve conditions for wildlife in the area. At the same time, the future buildings are secured from day one against intense cloudbursts with a local rainwater drainage system. This innovative project was nominated for the Danish City Plan Award 2017. In Naturbydelen, the natural surroundings and drainage system were created first, with the buildings later adapted to their natural surroundings. Naturbydelen will be characterized by short distances between buildings and private and public spaces, and with natural areas as a replacement for pavements and concrete. The approach taken in the Naturbydelen project largely protects the local nature while supporting and restoring sustainable ecosystems and local biodiversity. A number of local partners participated in the development of the project: for example, the nature playground was established in cooperation with the surrounding landowners' associations. Ringkøbing-Skjern municipality is the largest municipality in Denmark.